This product has been discontinued. Please see SureGuard SC as a replacement product. Clipper Herbicide is a specially formulated herbicide that’s designed to help control invasive and nuisance aquatic weeds such as water lettuce, duckweed, cabomba, watermeal, giant salvinia, Eurasian watermilfoil, and more. This fast-acting contact herbicide uses Flumioxazin as its active ingredient for an effective management of undesirable aquatic vegetation in slow moving or quiescent waters. It offers reduced PPE requirements in a water dispersible granule formulation for easier handling and application. It also doesn't accumulate in sediment because it dissipates fast from the water column. It's ideal to use in bayous, canals, drainage ditches, lakes, marshes, ponds (including golf course ponds), and reservoirs. Currently registered in the following states: AL, AK, AZ, CA, CO, CT, DE, FL, GA, HI, ID, IL, IN, IA, KS, KY, LA, ME, MD, MA, MN, MI, MS, MO, MT, NE, NV, NH, NJ, NM, ND, NC, OR, OH, OK, PA, PR, RI, SD, SC, TN, TX, UT, VA, VT, WV, WA, WA, DC, WI, WY, WV. Mix with water having pH of 5 to 7. If pH is higher than 7, use an appropriate buffer to reduce pH to desirable range. Fill clean spray tank 1/2 full of desired level with water and add buffering agent if necessary. Add the required amount of Clipper Herbicide to the spray tank while agitating. Fill spray tank to desired level with water. Ensure that Clipper Herbicide is thoroughly mixed before making applications. Agitation should continue until spray solution has been applied. Mix only the amount of spray solution that can be applied the day of mixing. Apply Clipper Herbicide within 12 hours of mixing. Apply Clipper Herbicide in 5 gals of water per acre, with a maximum spray pressure of 40 PSI. Application at less than 5 gals per acre may not provide adequate weed control. Higher gallonage applications generally provide more consistent weed control. Use nozzles that produce flat or hollow cone spray patterns. Use non-drip type nozzles such as diaphragm type nozzles to avoid unwanted discharge of spray solution. The nozzle must be directed toward the rear of the aircraft, at an angle between 0 degrees and 15 degrees downward. Do not place nozzles on the outer 25% of the wings or rotors. Apply Clipper Herbicide as a broadcast spray at 6 to 12 ounces of formulated product per acre plus an adjuvant approved for use in aquatics. 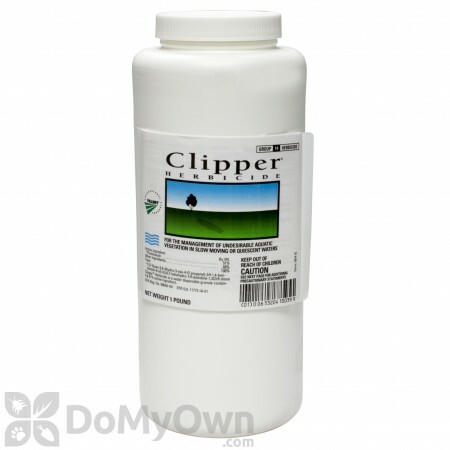 Apply Clipper Herbicide in a minimum of 30 gals of water per acre to all areas of the water body where weeds exist. Coverage is essential for effective control as all floating weeds need to be exposed to lethal concentrations in all parts of the water body. Any untreated escapes or re-introductions of plants that were not treated will reestablish in areas where surface weeds had previously been controlled. If a second application is required to provide control, it is recommended that a treatment be made once the return of these weeds is first observed, but no sooner than 28 days after the last treatment. Clipper Herbicide may be tank mixed with 2,4-D, diquat, glyphosate or other registered foliar applied herbicides for enhanced control of floating and emergent weeds. Consult a manufacturer’s label for specific rate restrictions and weeds controlled. Always follow the most restrictive label restrictions and precautions for all products used when making an application involving tank mixes. Apply Clipper Herbicide at a rate that will produce an initial concentration of 200 to 400 ppb (of active ingredient flumioxazin) in the water column. Clipper Herbicide is rapidly absorbed by target plants, but also breaks down quickly in water with a pH greater than 8.5. The pH of water surrounding mats of submersed vegetation can exceed 8.5 by early to mid-day, due to photosynthetic processes. Application of Clipper Herbicide under these conditions may provide only partial weed control, and regrowth is likely. For best control, apply Clipper Herbicide in a minimum of 30 gals of water per acre in the early morning to actively growing weeds and early in the season before surface matting occurs. So far so good! We have a 1/2 acre pond that for 2 years was covered with water meal. Last summer we heard that grass carp would eat the nasty stuff. We put 8 in the pond and it looked as if they were eating it, but 2 weeks later the pond turned and every fish in the pond died. This year we decided to try Clipper. I waited until the wind blew it all to one side of the pond and then I sprayed it and the edges of the pond. Within 2 days the water meal was 90% gone! Now 2 weeks later, the water is much clearer and there is a sparse sprinkling of water meal that I either missed or it's returning. I'll spray it again when it accumulates on one side of the pond, but I have no doubts that it will kill the stuff. 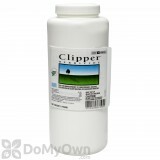 Purchased Clipper Herbicide to control duck weed in a small sewage treatment plant pond(5000 sq. ft.).Product worked great, cleared duck weed right up.This will be our go to remedy in the future. I used Clipper on a very tough, almost 90% infestation of water shield (also known as dollar bonnet) in my one-acre pond in Georgia. Previously, I had used a well-known systemic aquatic herbicide with limited results. Using the recommended surface application rate for Clipper, I sprayed the weeds in the early morning on two separate occasions. The response has been incredible. Kill showed in a week, and despite being a contact product, Clipper has actually killed leaves not sprayed directly, perhaps through the movement of sprayed surface water. Very impressed with this product. It's highly cost effective (compared with Navigate). The safety data is reassuring. And while we will see how effective the kill was next spring, when (and if) weed re-growth occurs, I am very confident of results. Plus, I still have plenty of Clipper remaining for a re-spray. Highly recommend this product, and also very appreciative of helpful advice received from the team at DoMyOwnPestControl. We have a 1/2 acre pond. We had string algae and watermeal. Last year the entire pond was bright green and the water was not visible. This year I decided to try Clipper. 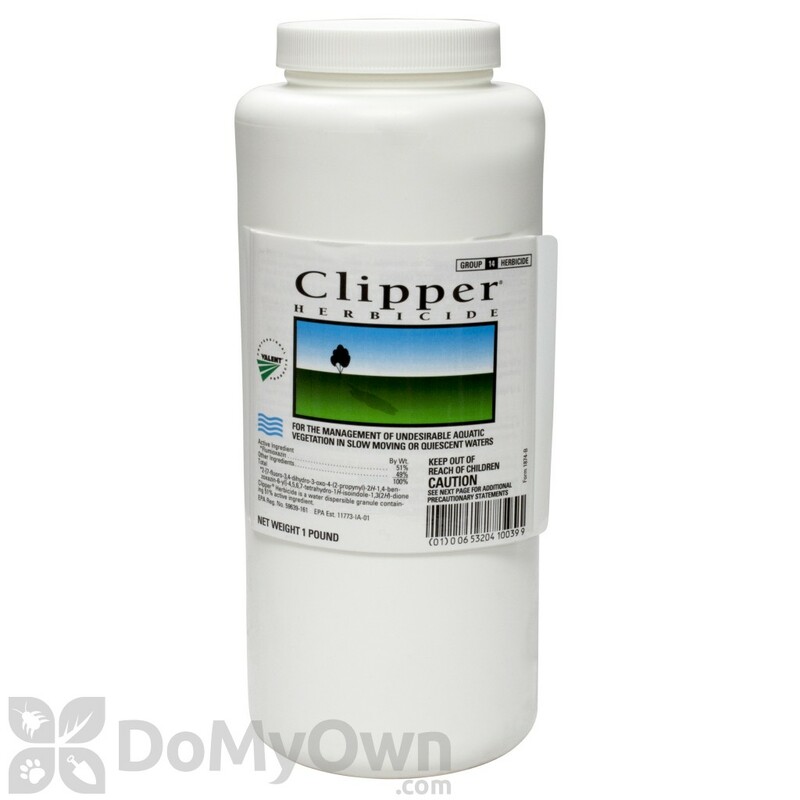 Clipper is the only product I've tried so far that controls watermeal. It is also pretty awesome for algae control too. Dissolves easily - I use it with a non-ionic surfactant. I have very much enjoyed seeing my pond this summer as have my neighbors. First time using it. Very pleased with the results. In the long run I think this will be my best results per dollar. I have a 1/2 Acer pond that has (2) types of duck weed, Milfoil, Coontail and Cara. I tried to follow the manufactures recommendations to apply then weeks later apply a second application. on the first application I used 1lb. I wasn't able to get the second application in but the fist app seemed to do a great job. I applied to the pond with a pump sprayer on the surface and it did a great job along the shoreline. It even got the cara. I'm not sure how well it work in the deeper areas. I wish I would have been able to get the second application down because there are weeds coming back about 2 months later. Is Clipper Herbicide a granular herbicide? Clipper Herbicide is a wettable granular that you dilute with water. Please find our application video on the product page. Is Clipper Herbicide safe for frogs and tadpoles in the pond? Clipper Herbicide is safe for aquatic organisms if applied as directed on the product label. How many 1-lb. bottles of Clipper Herbicide do I need to treat a 2-acre pond for watermeal? Can Clipper be applied in November in Kentucky? Clipper Herbicide can still be applied as long as the weeds you are treating for are actively growing and temps are above 60 degrees at time of application. Will Clipper herbicide be harmful to water lilies rooted in the bottom of the pond? Is Clipper a direct contact herbicides? We have pesky duckweed that we want to eradicate without harming our desirable water lilies. While Clipper Herbicide does not list waterlily as a controlled weed on the product label we cannot say that it would not harm it. We would recommend checking directly with the manufacturer to be sure it could be used around it with no harm to the roots. NuFarm can be reached at 800-345-3330.